The musical highlight of the Christmas season is, for many people, Handel's Messiah. The Christmas portion of this glorious oratorio focuses on the nativity of Jesus Christ, and is being presented twice this weekend in the Northwest Corner. 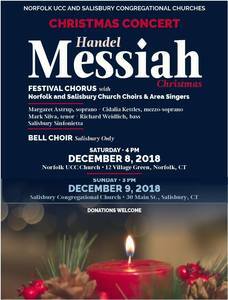 The first concert will be held on Saturday, Dec. 8 at the Norfolk Church of Christ, 12 Village Green at 4 p.m. On Sunday it will be presented at the Salisbury Congregational Church, 30 Main Street, at 3 p.m. The event will feature the voices of the Festival Chorus, including the Norfolk and Salisbury church choirs and other area singers, including Margaret Astrup, soprano; Cidalia Kettles, mezzo soprano; Mark Silva, tenor; Richard Weidlic, bass; and the Salisbury Sinfonietta. Admission to both concerts is free, but donations are welcomed. Combined Choirs - Glorious Music!